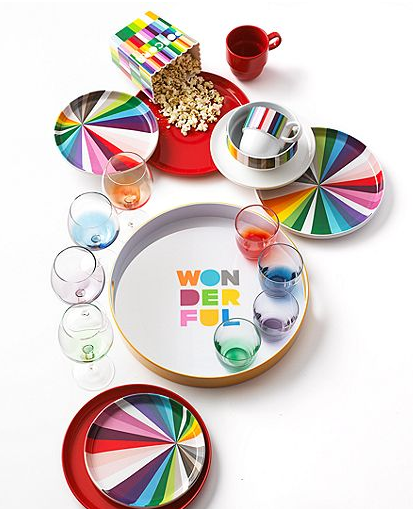 What It Is: An exclusive line of rainbow-hued serveware for Macy’s from famed New York design duo Robert and Cortney Novogratz. Made from sturdy melamine and stoneware, this colourful line includes everything you need to set the table in a way that will instantly bring a smile to your face. From cheerful plates and mugs to splendid serveware (I’m dying for the cute popcorn tub! ), this is one collection that seems perfectly in tune with the upcoming summer season. Who It’s For: Your amazing hostess sister, to set the table for a summer fete. Your just bought a new cabin best friend, as a fun and cottage-appropriate housewarming gift. Your son or daughter, who just moved out for the first time and could use something more cheery than old hand-me-down dishes. Where It’s At: Macy’s, which offers $9.99 flat rate shipping up North. Speaking of colour, how about a bonus entry into my Lazypants giveaway? Tell me in the comments below: Would this colourful serveware ever show up on your table? What’s your fave piece? (Click on the Macy’s link above to see the full collection). I like the 16 oz ‘smile’ and ‘hot’ mugs. I like the “Wonderful tray and the”Happiness ” glasses. They would all brighten up my patio. All on sale also. I would love to give the tray to my friend, we are always invited to her patio in the summer. And the two canisters would be so useful and cheery. I don’t think it would hot my table but I do like the Wonderful Melamine Serving Tray – it would get use for serving on the patio. Gorgeous server ware for the patio. My favourite piece is the popcorn bowl. I would love to use these pieces — especially the melamine outdoors in the summertime. Such a happy collection. I like the Novogratz 16oz SMILE mug. I love it! So bright and cheerful! I love the popcorn tub too. It would get a lot of use at my house! I would love to put out these pieces on my table! I really like the “Wonderful” Melamine Serving Tray! Lazypants bonus entry: YES this colourful serveware would show up on my table & my fave piece would be “Novogratz Collection “Wonderful” Melamine Serving Tray Web ID: 1195406″. I’ve enjoying reading about the Novogratz & watching their tv show when it was on the air. Such an eclectic family where it somehow all works! love it! i like the popcorn tub, co cute! I’d totally use these. And the plates are my favourites. Very summery. They’re pretty, but I’d rather use something a little more subdued.